A trip to the Port and I decided to wear the dress that was too tight for me so I would be reminded of my need to be just a tad smaller for the up coming nuptials of Holly & Dave. It was either a hundred sit ups a day or eat less, neither of which were appealing, or frankly likely. “What you need, Ren advised, is a gut holder thingee Mum. Just to iron out those ripples”, as I waltzed up and down the hall way in my wedding attire options. Tara had stayed over night and she explained a day out was in order. “Ohh. I answered. So where are we going?” “To the markets, and then Uncle Grahams, and then the beach for a swim”. “Ohhh”, I answered. “That’s what you said before”, she said. “What?” “Ohhh…” she imitated. “Well I’m not sure I want to be out all day”. I answered. “Mum its called a ‘day off’. Its what normal people do. They slow down and just have fun. They relax and enjoy whatever the day brings”. “Ohhh…” I replied. “There you go again with your ‘Ohhhs’. “OK we’ll come”. I replied. First stop was the local market day in the now not so tiny town of Pokeno with a new subdivision explosion. Pokeno became famous when I was young for its delicious ice creams and even before we left home Gilbert looked back at me from the front seat with stars in his eyes wondering which flavour he might choose. “Umm some of these kids are allergic to dairy, I whispered, so I suggest you do that in secret somehow”. Wandering into the first stop, the markets. I found the local Rawleighs lady also sold delicious looking homemade biscuits. 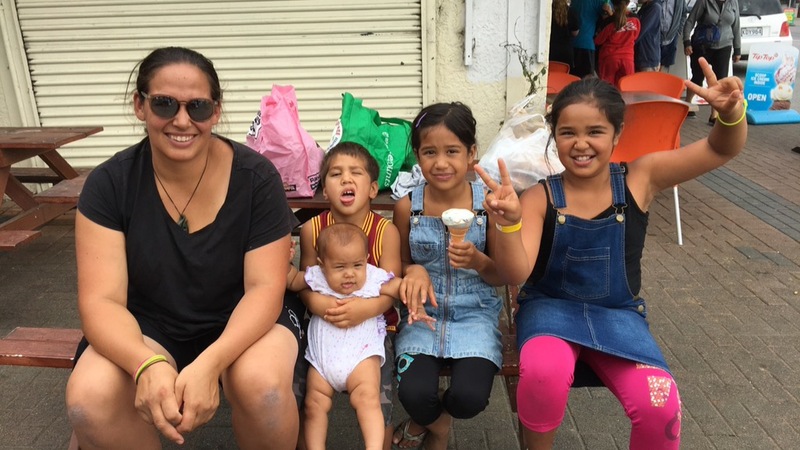 Some market research was in order as Kahu and Wheriko had planned to make biscuits and sell them outside the local dairy as an exercise in budgets and profits. Tai had decided he would make or buy lollies to sell. It seemed blatantly obvious to him that the only thing worth buying in a dairy was lollies, so he would stop people at the door and sell them his, before they even entered. Simple. We surveyed her offerings and prices and how many in a pack before deciding we should buy them anyway to take to Uncle Graham. The other items on my list to take to Uncle Graham was fresh home made breads, cheeses and salamis, of which there was none. But I did find a magnificent book on one of the old palatial homes of England and another on making the most of your pizza oven for Lindy. Further on I found threepence from my birth year made into earrings costing only $5 and a niece selling fresh veg so cheap, just ten dollars gave me two large bags full! My weight loss plan of wearing a tight dress doesn’t deter me from an ice-cream! Gilbert had given me a nod and slipped across the road to the ice cream shop, so we made our way there sometime after him and discovered they had a dairy free sorbet option and a huge single scoop was just $1.50, so of course it was one each before piling into cars again and heading out to Uncle Graham where lunch was scoffed outside so our unruly mob didn’t destroy the place, and then off to the local park where we hung out for a good hour as we reminisced about the bach across the road. We had sold it twelve years ago after owning it for about ten years and the kids had absolutely loved it there. The hour was full of ‘remember how we flipped the quad when we raced over the sand dunes’, with kids holding on for dear life to a hunk of ply or an old bedspread or whatever the latest piece tied to the back was. ‘How we could go either one way to the surf or the other way to the river’. ‘How Lai and Willie would come and all the kids would sleep on the lounge floor as it was only tiny with two bedrooms’. ‘How we’d BBQ every night and the kids would dash across the road and play in this very park till dusk or dark when I would come out and scream off the back balcony like a shrew if they didn’t come at first call’. 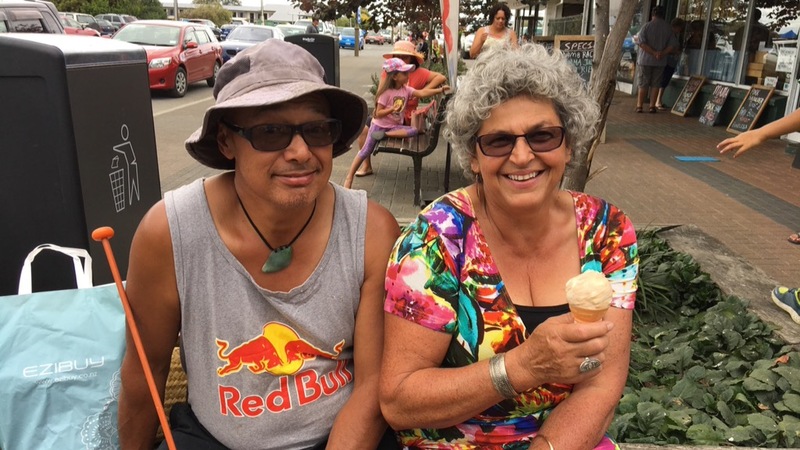 “Remember how when you got out in the sand dunes it was really easy to get lost and Mum showed us to look for the heart in the sandy hills and if you headed for that you would soon arrive at the path to the back of the bach”, Monie asked. “No”, Ren replied blankly. “So how did you find your way home then?” Monie asked. “I dunno”, was the reply! Amongst these chats was the regular screams of delight as everyone lined up for the flying fox. “Nan ny! Nan ny!” the kids started up the chant that was supposed to make me desperately want to have a go. “Soon, I called. Jesus you want the whole neighbourhood to come out? I shussed. Ok, I will have a go”. Tara held the flying fox seat while I considered how to leap on it knowing that as soon as it took my weight I would be off. “What if I hit the pole at the other end?” I asked Tara. “You won’t, she said matter of factly. I didn’t.” Somehow failing to see that her body weight of almost half mine could make a difference. “Renny didn’t hit it”, she added seeing my reluctance. “OK”, I answered. “Grab it high”, Tara instructed and after a couple of hesitated half jump ons, I was off. Screaming all the way as the massive pole at the end loomed up so fast I was sure I would just splat against it, let go and fall to the ground in a crumpled heap of broken ribs. 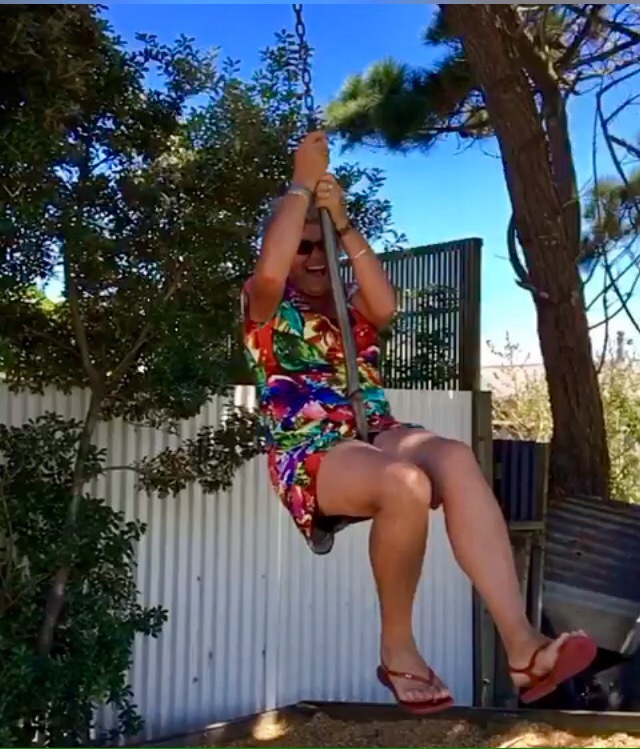 “Stooooop meeeeeee!” I screamed at Ren passing her as she swung round, kindly videoing me for the future delight of all and sundry, but just before what I was sure was to be impact, the top snagged on a stopper put there just for that purpose, and I was swung around to madly hurtle back. “Jeez that was fun, I said as I came to a stop in the dust at the centre point. I’m going to have another go”. “Get in line” Wheriko told me. I was now just one of the kids. We wandered down and stood right back at the edge while the others were in a little deeper laughing and playing while further out the surf rushed in and out in a wonderful display of a receeding tide. One minute ankle deep and the next over their heads, crashing in great frothy rolls of sea spray. “Is that Milan out there?” Monie suddenly asked me. “Where”? I asked peering into the distance. “With the two life guards”, Monie answered. “I can’t tell at this distance,” I answered staring hard to make anything out. “One of them is Tara’s friend’s husband, and another life guard”. “Hmm”, I looked at Tara who wasn’t perturbed at all, still chatting with her friend and the little ones at her feet. Turned out Milan had just been rescued! Holy Mary, Jesus and Joseph….What! Yep. He was with Dom who was an experienced surfer on a boogie board when Milan was pulled out into a rip. He went to ‘put his feet down, but couldn’t feel the bottom’, he calmly tells me later as we drive home. He looks up and realises he’s drifted away from Dom, but before he can blink, a lady surf life saver is there beside him who asks “Are you alright?” “No”, Milan says. “Well you really shouldn’t be out here, you’re past the flags. You know you should swim between the flags?” At which Milan looks up and then informs her that they must have moved the flags, because last time he looked they were over there! “Ahhh no, she smiles, you have moved”. “Come on she says, putting on her flippers, we’re going back in”, and she calmly guides him back to shore where Dom meets up with them. He later tells Tara the current was so strong he couldn’t get to Milan despite trying to swim over to him. We look at each other in disbelief. That’s how easy it easy it is. Milan however is quite calm and a testament to how beautifully the surf life saver managed him, so as to teach him something, but not scare the hell out of him. Perfect! The younger kids spent the next hour finding crabs and other slimy stuff in the rock pools while the bigger kids collected rocks. The hardest part was deciding which rock to bring home, as if we don’t have enough here! Fish n chips in the Tuakau park rounded off the day. “Ahhhh, I could get used to this ‘doing nothing business’ I said to Gilbert as we slipped into bed. Today was great. Except for the rescue bit…I just might write a letter and send a donation”. 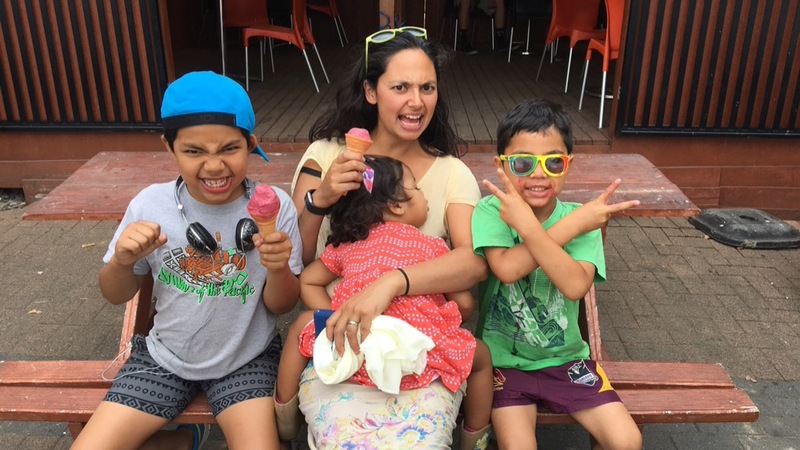 This entry was posted in Whanau=family and tagged gut holders, ice cream, Port Waikato, Surf Life saving Rescue. Bookmark the permalink. It’s called shedding for the wedding and I am trying to figure out how to make it happen. Life is one long celebration, there is always tomorrow and if not tomorrow then maybe Monday………………..